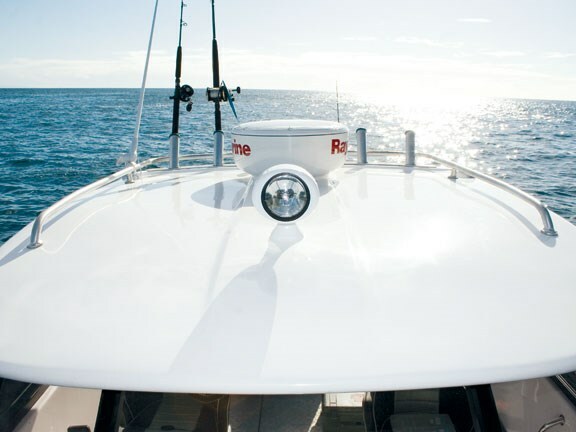 Our test vessel was the open hardtop version of the boat, which is also available in an enclosed hardtop. The open hardtop seems almost spartan because there is so much room to move. There is no real transition point from the cockpit to the cabin area and the forward cabin has been kept to a functional minimum size. The bunks are full length and there is no shortage of legroom, but no unnecessary space has been allowed for anything other than sleeping, underbunk storage and a toilet, which was still to be fitted. The space has been utilised in the cockpit and helm area – exactly where it should be. 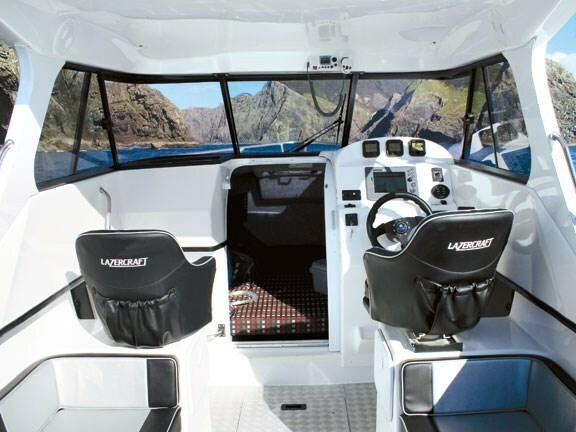 I feel the open hardtop is the ideal configuration for fishing our northern waters. Cool in summer, warm enough in winter, and dry on the rough days. Straight of the showroom floor, this boat needs added toys to be ready for such an encounter, but the bones of a first-class gamefishing weapon are most certainly here. 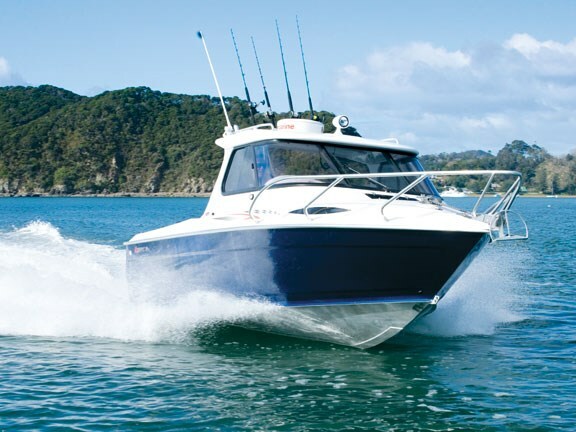 Team Southern Lazer specialises in building top quality aluminium hulls with GRP hardtops. The fibregass topsides have a level of finish inside and out that is very difficult to achieve in aluminium. The glass cabins are warm. There is plenty of misinformation in the industry regarding this sort of hybrid construction. It is said that the joins are subject to cracking over time due to lack of adhesion between the aluminium hull and the fibreglass topsides. Chris assures me that this is simply not the case. The entire transom plate and all the mounting bolts are insulated from any contact with the aluminium hull. 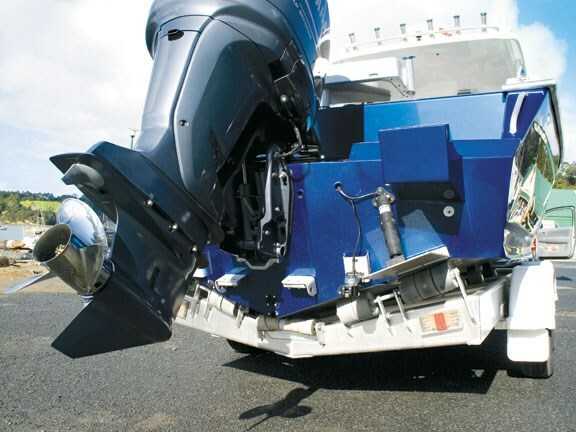 It greatly increases the lifespan of the hull by preventing any electrically stimulated corrosion or dissimilar metal contact between the engine and the hull. As an added precaution the hull has built in sacrificial annodes that will help protect the hull when in water. The custom trailer supplied and manufactured specifically for this boat by Southern Lazer has duel axels and is braked on all four wheels. Speced to 2500kg, this trailer has duel geared manual winch but I will say we did not need the low gear while winching the 7.4m Lazercraft back onto the trailer later in the day. Actually it was surprisingly easy to winch this boat back into its towing position and I am no Mr T.
Storage on board is no problem. Good thought had been put into the transom area, with the appropriate spaces built to take standard fish bins stowed out of sight behind swinging doors. A good sized underfloor wet locker sits forward of the 245L fuel tank. There are enough rod holders for general purposes between the over-head rocket launcher and the four mounted in the covering boards. The floor was still bare aluminium but Chris had floor coverings on the way. The well upholstered bucket seats are comfortable and sat at an excellent height for visibility. I was pleased to see good use of handrails for working on the front deck in "not so calm" conditions. There is a good quality hatch in the deck to allow easy access to the anchor winch if that is your preference. The cabin roof also sports a fully remote controlled spotlight. The Lazercraft XP743 features a fully automatic rope and chain anchor winch system, which worked flawlessly when we set it in quite deep water. What I particularly liked was the easy access to the locker. Chris had commented that larger vessels like this that are forced to stay within road-legal beam constraints can behave like overgrown canoes. I could see no real indication of this as Chris moved about the boat. Movement was minimal. The helm has a real driver’s feel to it. The visibility is exceptional, with the full surround rounded glass windows and nice high seats. The wheel and the throttle control are well positioned. I cannot speak highly enough of the Yamaha "fly by wire" remote control system. It has the perfect balance of resistance and feather-light touch that gives the driver a sense control that is confidence- building when manoeuvring expensive hardware in tight situations. The out-of-the-hole performance was impressive as expected, and I enjoyed the roar of the V6 engine sitting behind me. With the throttle hard down we quickly got to just below 40 knots all with just a factory standard propellor. The big Lazercraft has a delightfully light feel on the helm that makes you want to throw it around like a sports car. Hard into the turns the boat performed flawlessly, and by keeping the outboard tilted deep in the water there was no hint of cavitation or any other unsureness in the turn. 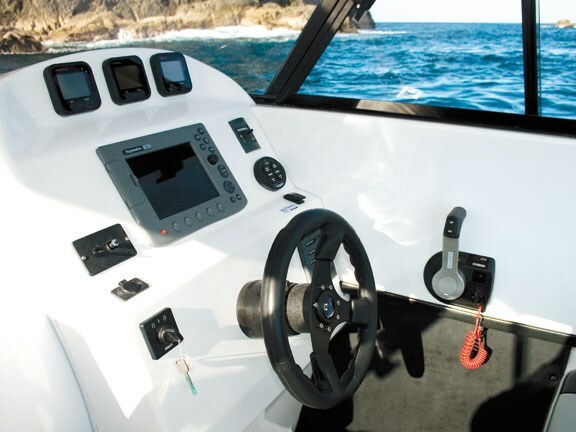 It is also worth noting the highly effective trim tab installation. The fingertip control and LED readout make it easy to see what adjustments are needed, if any, and they actually work. Trimming this vessel out correctly is child’s play. The fishing test proved the Lazercraft XP743 Generation II to be a very straightforward and predictable vessel to manoeuvre in tight situations and we were able to achieve a precise anchoring position even without the benefit of a freefall anchor winch. The trip home was a pleasure and gave me a chance to try out the quality non-slip filleting board, which comes with the vessel, on our meagre catch. Overall this is a very high quality boat well suited to a wide range of uses. 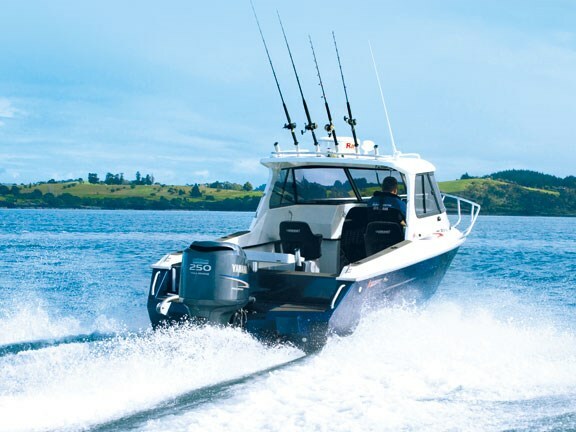 As a general purpose vessel it is ready to go off the trailer but there is plenty of room for customisation for those who want to specialise in something like big game fishing. See Lazercraft boats for sale.